The Himalayas, which divide India from Nepal. After the hell, fire and brimstone of an evening in Varanasi (and then the redeeming beautiful morning after), we packed up our bags yet again, and headed for Khatmandu. 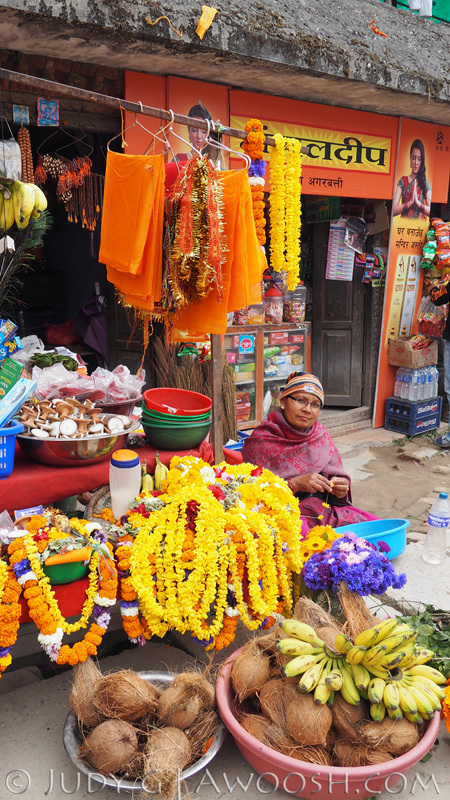 Since the devastating earthquake of April 2015, tourism has hugely suffered in Nepal. Direct flights from Varanasi are currently cancelled, and the only way to get there from Varanasi was to fly back to Delhi, and then connect there for the Khatmandu leg. So it was a bit of a roundabout journey, but fortunately Delhi International Airport is quite new and modern. Bonnie once again demonstrated her fantastic organizational skills in keeping us wrangled and ticketed, and so other than the usurious price for a beer at the airport bar, it was all good. Here is a traveler’s tip for Delhi Airport: there is a hotel in the international terminal (Holiday Inn Express) that is behind security, meaning you don’t have to exit through Customs & Immigration to get there, nor go through Security to/from the hotel. They have a nice quiet lounge there – and for the price of a beverage, they seem cool with folks hanging around for a few hours before their flight. So we went there, had a drink (or two ;^) and played cards to kill a long layover on our way home from Khatmandu. This would also be a good place for a short stay while in transit through Delhi. We arrived in Khatmandu very late in the evening, gathered our bags, piled on to a bus, and were taken to our hotel, with the plan for a reasonably early start the next morning for a big day of touring in the city. Kathmandu has a different vibe than the cities we visited in India. Although also very populous, the people seem a lot more laid back. Drivers are more patient. Seeing the incredibly long line ups for fuel (India is apparently stifling the flow of gas to Nepal in order to force the Nepalese into some sort of agreement), I could imagine people getting very frustrated and aggressive. But we saw none of that. I think it has something to do with the very calm and peaceful influence of Buddhism. 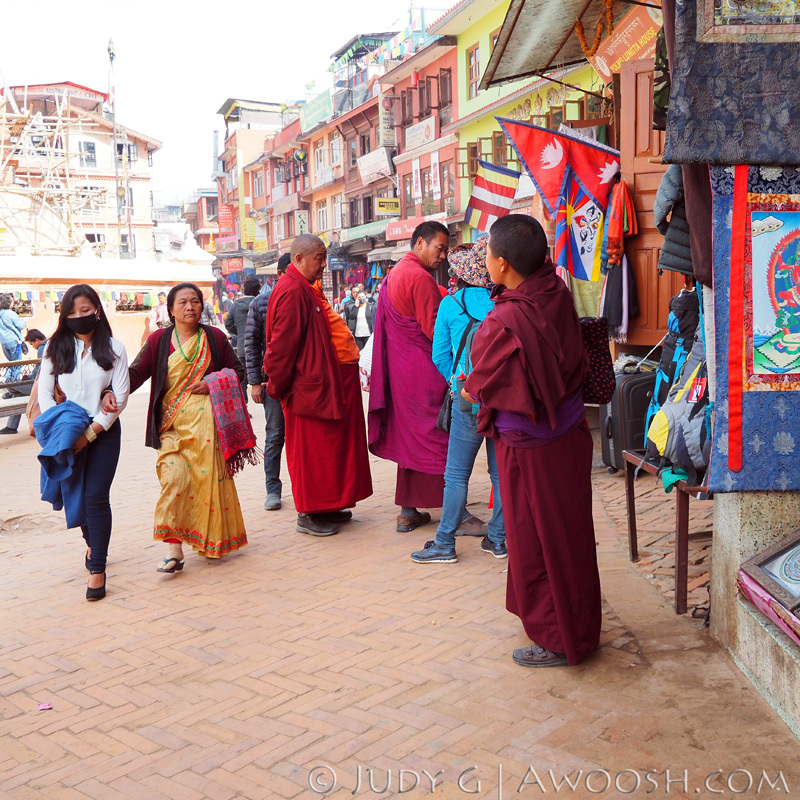 Our first stop of the day was Bouddhanath Square – the site of a famous Buddhist stupa. A stupa is a large rounded structure with a spire (and a tree of life). They are said to be designed to look like Buddha seated in meditation, with the spire as his crown. So these ornate buildings are Buddhist temples of sorts. Religious relics are stored in them, and monks also meditate in these spaces. 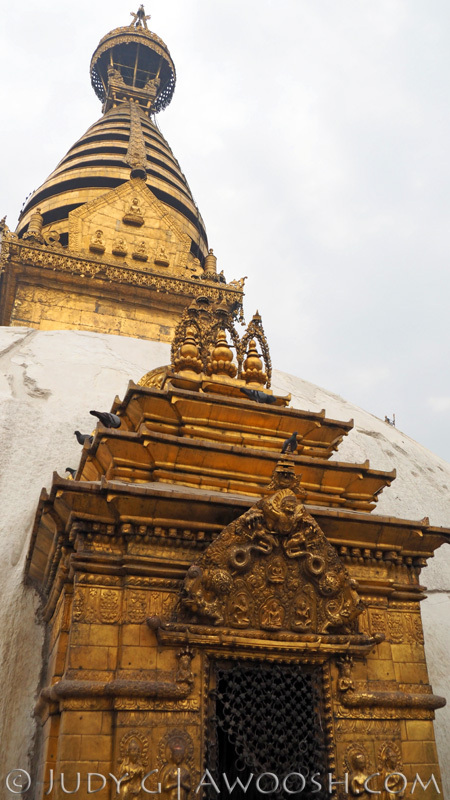 This particular stupa was notable for being one of the largest in the world. 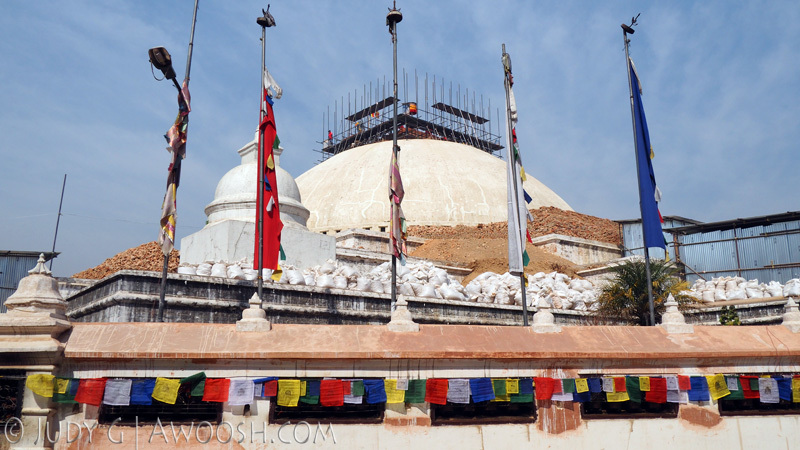 The Bouddhanath Stupa was significantly damaged in the earthquake, but when we visited, it, like most of Khatmandu, was in the process of reconstruction. The condition of the stupa in March 2016. I am guessing that they are going to use some of the rubble from the collapse in the reconstruction, as rather than removing it from the site, it is piled up near by. 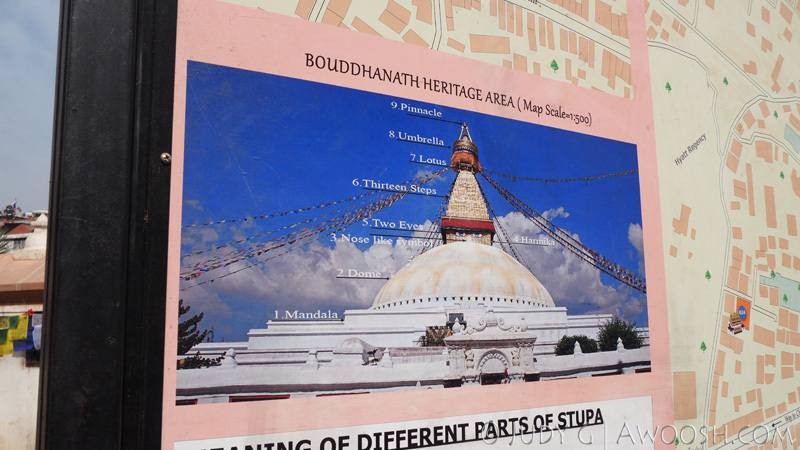 What the stupa will look like when reconstruction is completed. 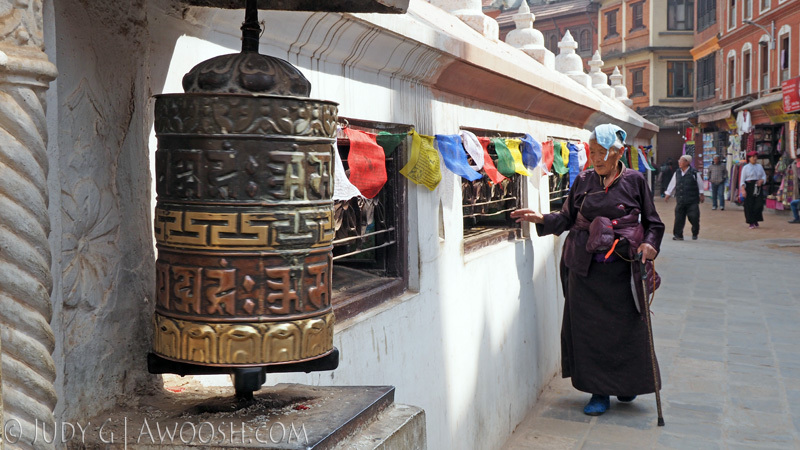 A Buddhist spinning the prayer wheels at the base of the stupa. Street scene from the square surrounding the monument. 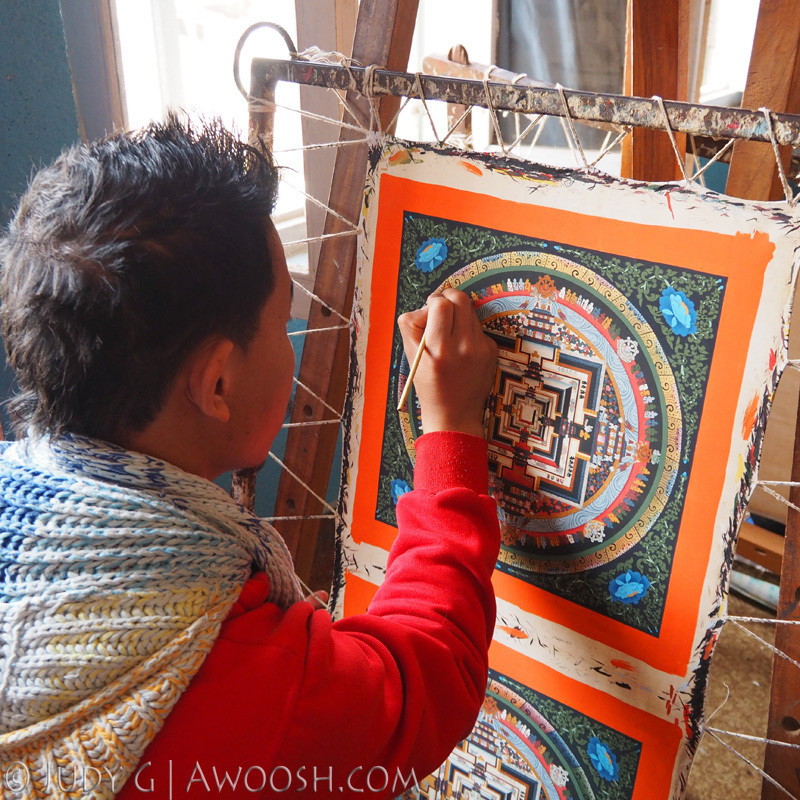 One of the lovely things about Nepal is the gorgeous rich colours used in textiles and decorations. Incredibly detailed artistry in the painting of a mandala. Mandalas are used for meditation. Our next stop was a quick walk through a ghat in Khatmandu. 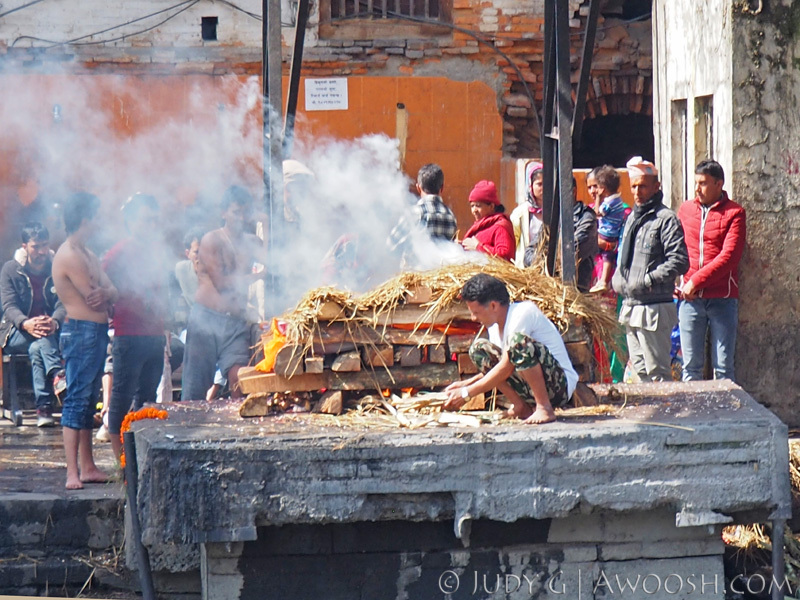 Buddhism is a branch of Hinduism, and the traditional cremation of the deceased at the water’s edge is very much alive and well in Khatmandu. When we arrived on scene, one open air cremation was just coming to a close, while another was just beginning. We sat quietly, just across a small, filthy river, as the pyre was built, and then the body brought to lie on it. We then witnessed the ceremony around the lighting of the fire. Somehow, seeing this done in daytime made it less macabre to me than the night time ghat viewing in Varanasi. 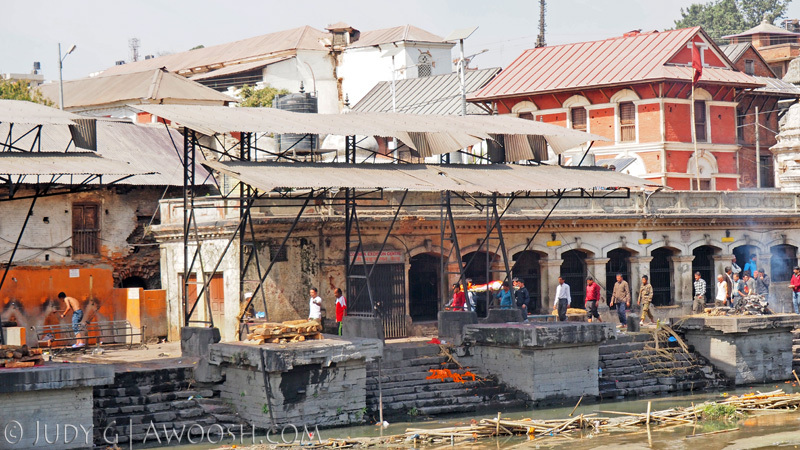 The ghat in Khatmandu. The smoke to the right is from the cremation that was just finishing as we arrived. To the left you can see the wood “cradle” that has been built to receive the next body for burning. I took this image from across the river, with a built in teleconverter, so I was not nearly as close as it would seem. Here, the pyre has just been ignited. The guy in the white shirt is working at the ghat, helping with building fires, and pushing the smoking remains into the water. The three guys to the left are the mourning relatives of the deceased. Back on the bus yet again, heading for our first Durbar Square – Bhaktapur Durbar Square. It is a bit confusing as there are three ‘Durbar Squares’ in Khatmandu. 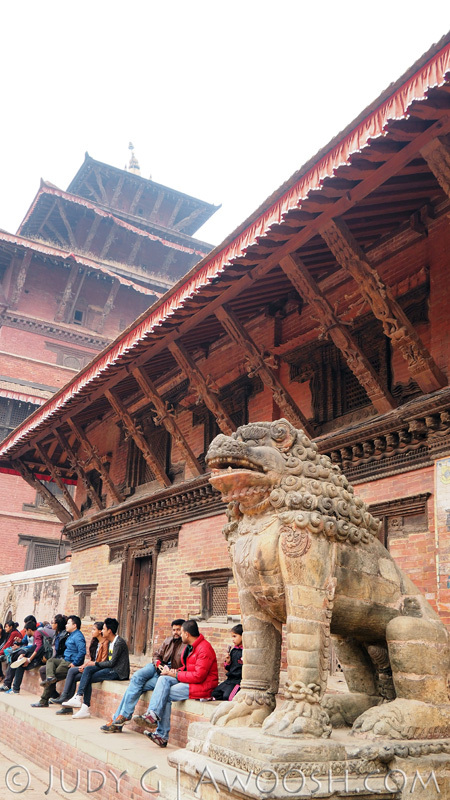 The city sprawls over what were previously three Nepalese kingdoms – and each of them had its own Durbar (meaning palace) square. 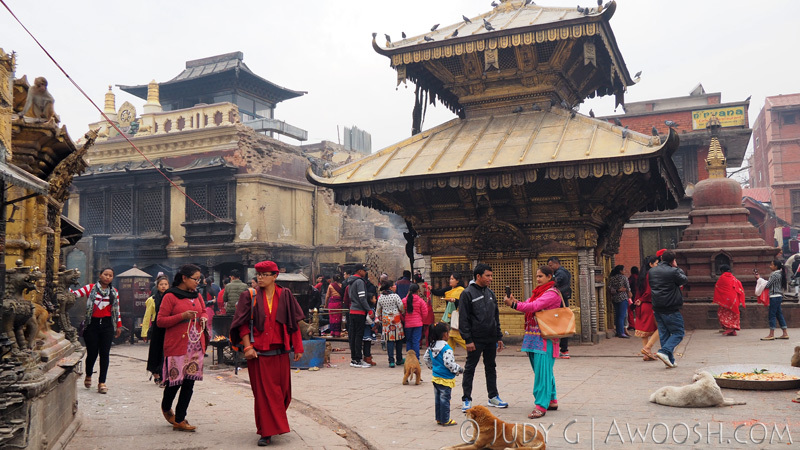 The main Durbar Square of Khatmandu city was badly damaged in the earthquake and is presently undergoing significant reconstruction, and so we were not taken there. All three of the Durbar Squares are UNESCO World Heritage sites. 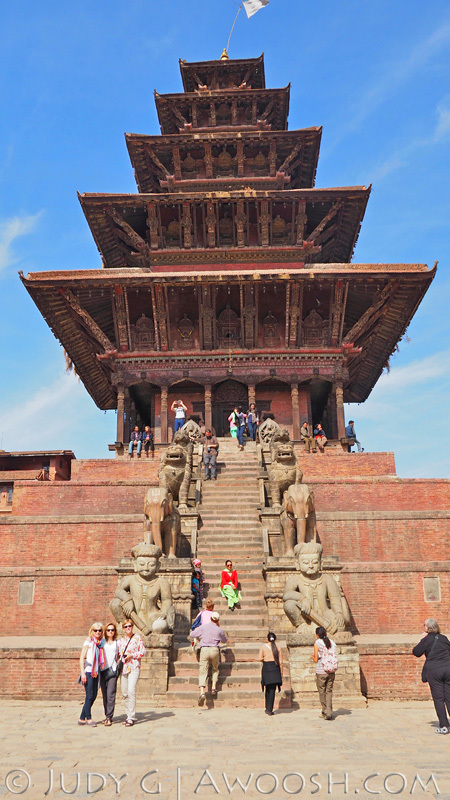 The Bhaktapur site is quite extensive, and is comprised of a series of temples, a palace, and gates – which figure large in Buddhism, as they do in Hinduism and Islam. 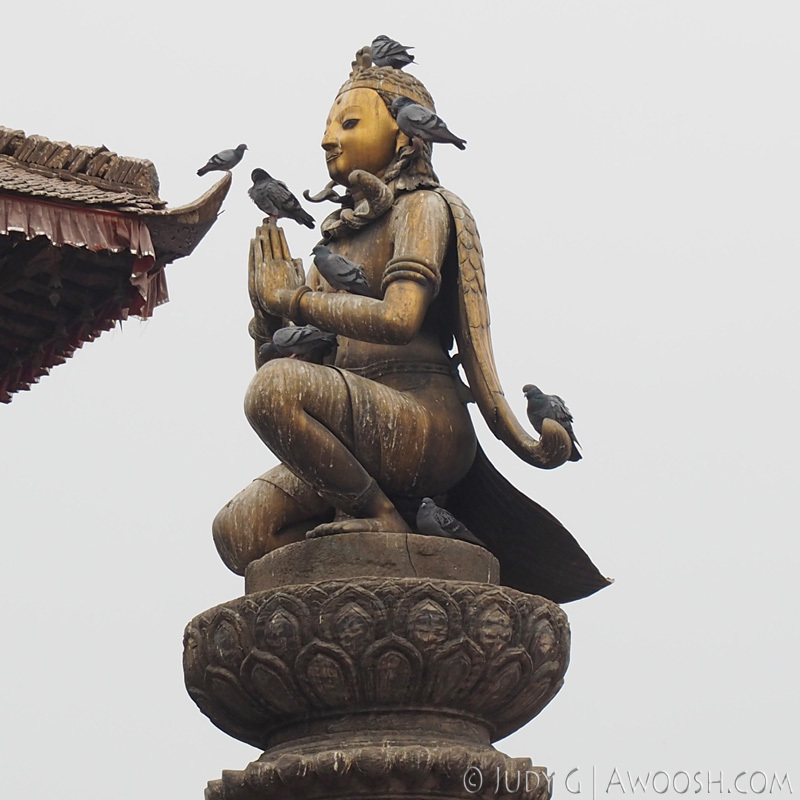 We saw quite a few buildings propped up like this in Khatmandu. The earthquake shook buildings off their foundations and caused walls to lean. Other, less robust buildings simply crumbled. A large, pagoda-style temple in the square. We found some great little shops adjacent to this square and had a fine time buying scarves and other trinkets. 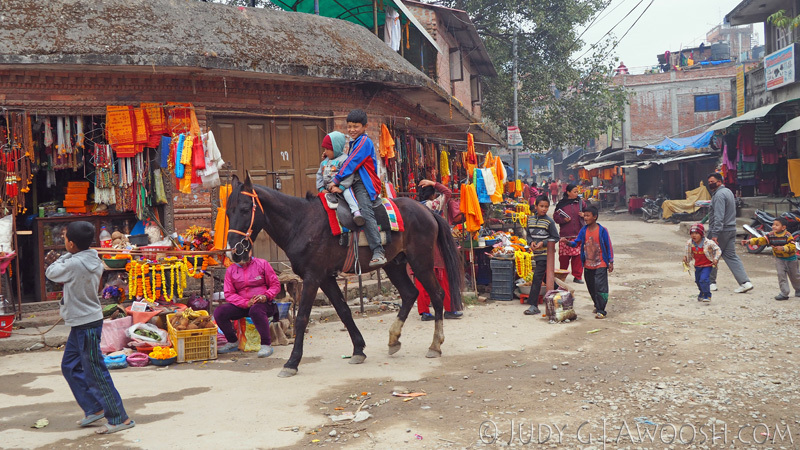 Bonnie had advised us to save most of our shopping for Khatmandu – the city and its vendors are really struggling as tourism is so slow, and she knew they could really use our business. 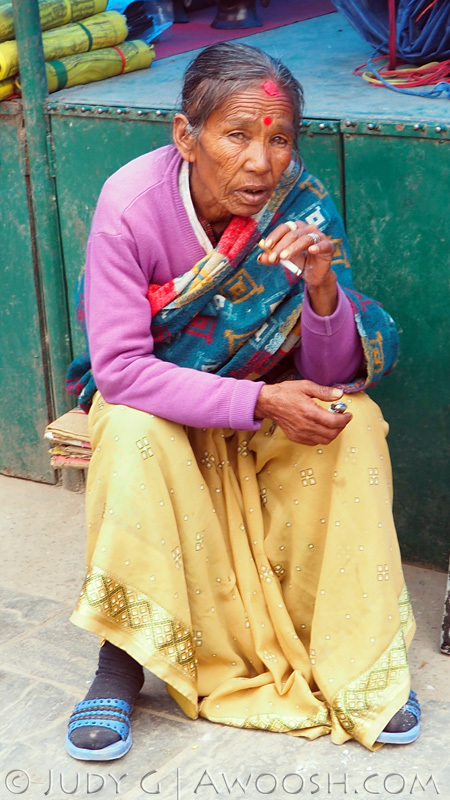 We also found the vendors in Nepal to be generally less pushy than those in India. 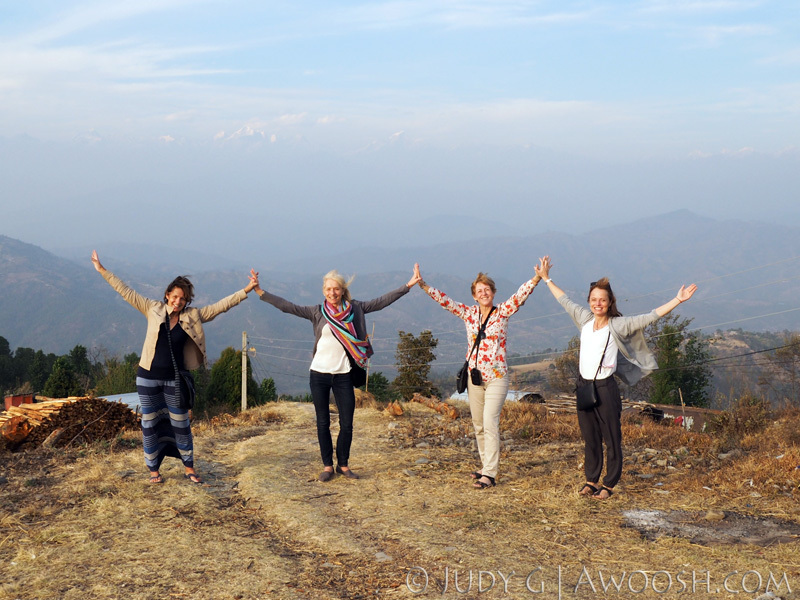 Later that afternoon, we were offered an (optional) bus excursion to head out of the city into the foothills, to have our first view of the magnificent Himalayas and to get a sense of village life in Nepal. And the weather gods were with us this day, as the skies were pretty clear. 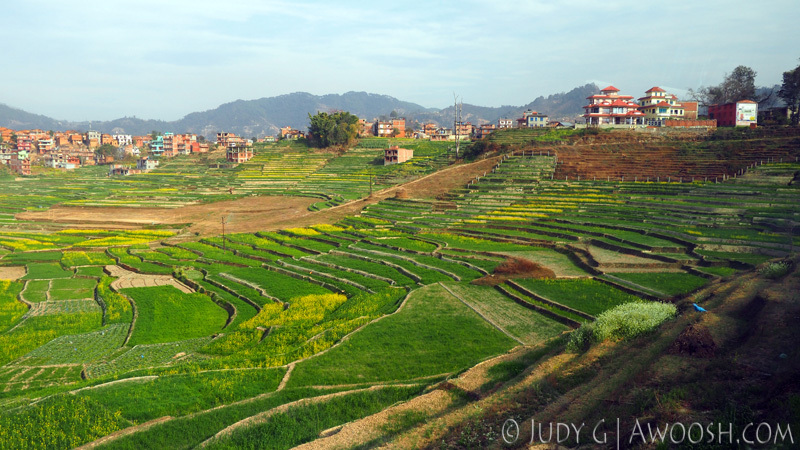 The next day, the Khatmandu valley would be filled with oily smog – which made it hard to breathe, and offered up crappy light for photography. In the foothills of Khatmandu. Beautiful lush green rice paddies. 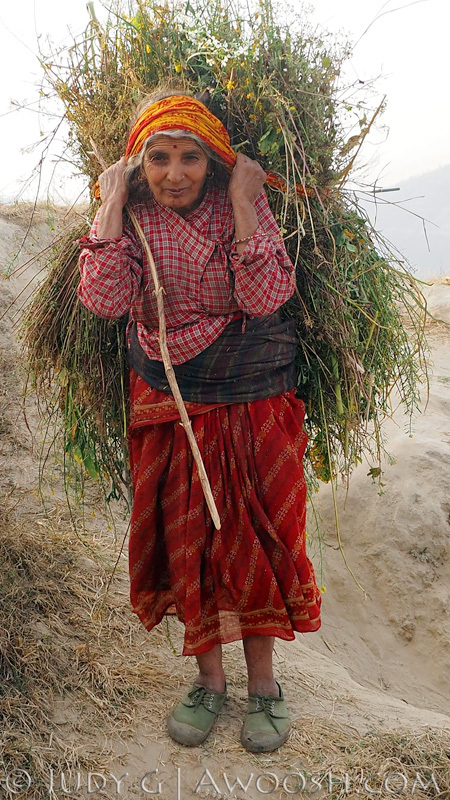 A local villager working hard for a living in the foothills of the Himalayas. 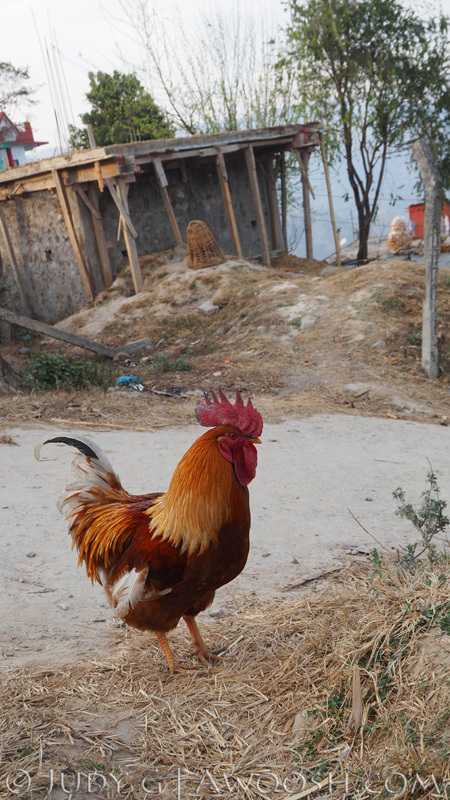 Nepalese rooster :^). The Buddhists of Khatmandu are not typically vegetarians, unlike many of the Hindus in northern India. 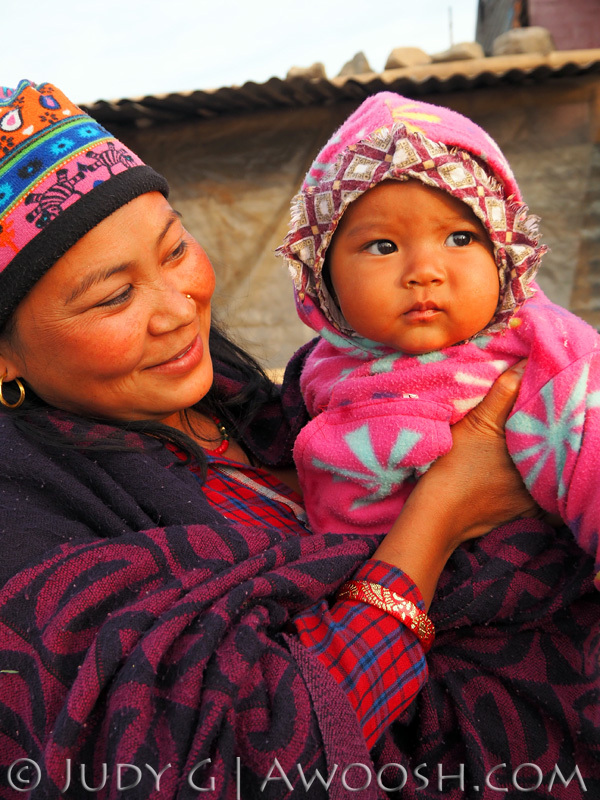 Mother and child in the village. Some Nepalese tend to look more Asian than Indian. Our final day of touring started with a visit to Budhanilkantha Temple – an outdoor temple compound in the outskirts of Khatmandu. 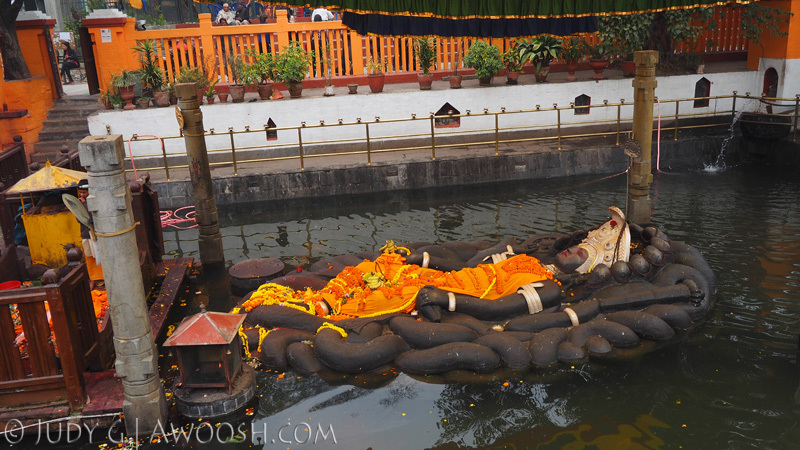 Here there is a large reclining statue of Vishnu, one of the main deities of the Hindu religion, from which Buddhism sprang. 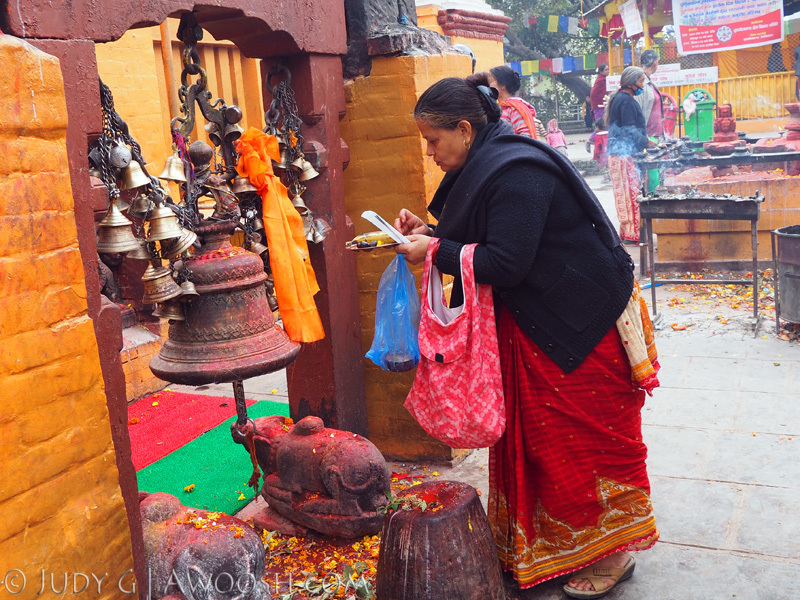 A Nepalese woman leaving an offering at one of the many shrines on the site. Most often the offerings are flowers, marigolds in particular. Bells are also rung. Street scene in the town just outside the temple complex. I love the happy smile of the kid on the horse. 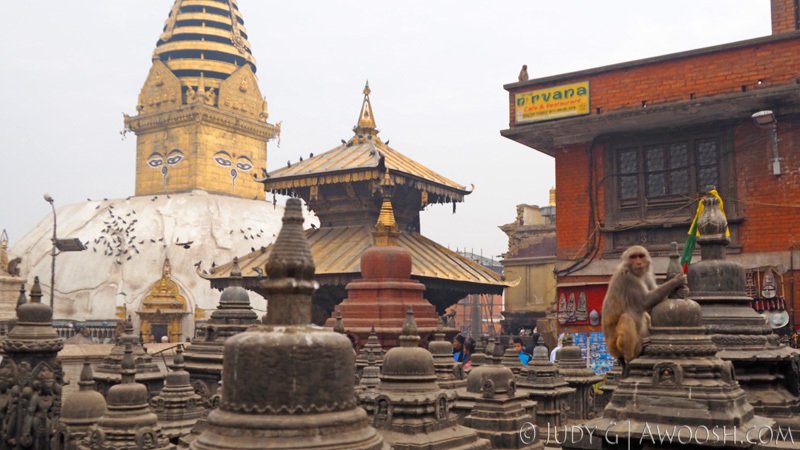 The next stop of the whirlwind Khatmandu tour was the ‘Monkey Temple’ – Swayambhunath Complex, atop a hill in the city. On a good day, there would be lovely views out over Khatmandu. But as I mentioned above, we weren’t so lucky. The air quality (and the light for photography) on this day were downright sucky. 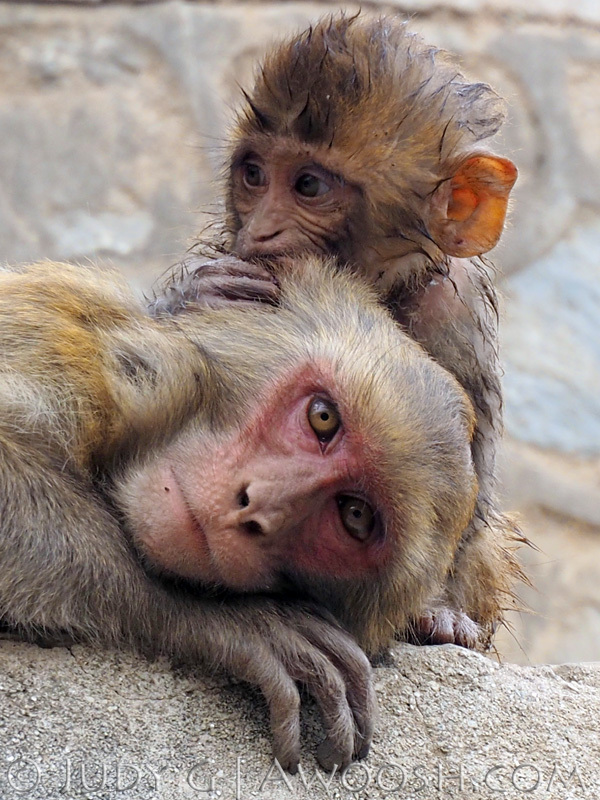 There are lots of monkeys like these at the Monkey Temple. 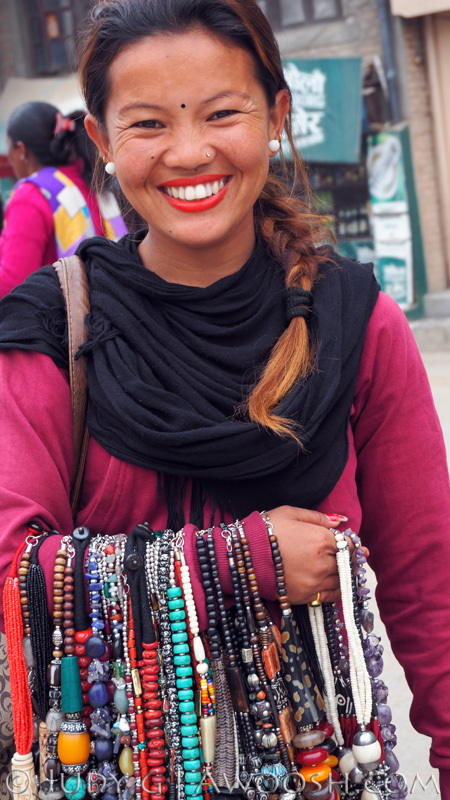 A Nepalese lady, who sells trinkets in the tourist gauntlet at the bottom of the long steps up to the temple courtyard. The Swayambhunath temple complex at the top of the hill. Lots of small shrines surround the stupa. From this angle you can see Buddha’s eyes on the steeple of the stupa. 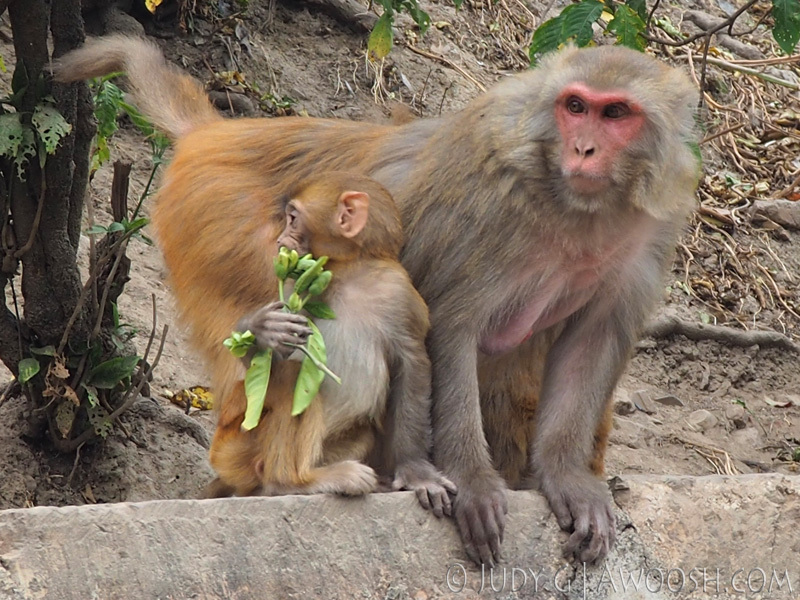 To the right, one of the many monkeys freely roaming the site. 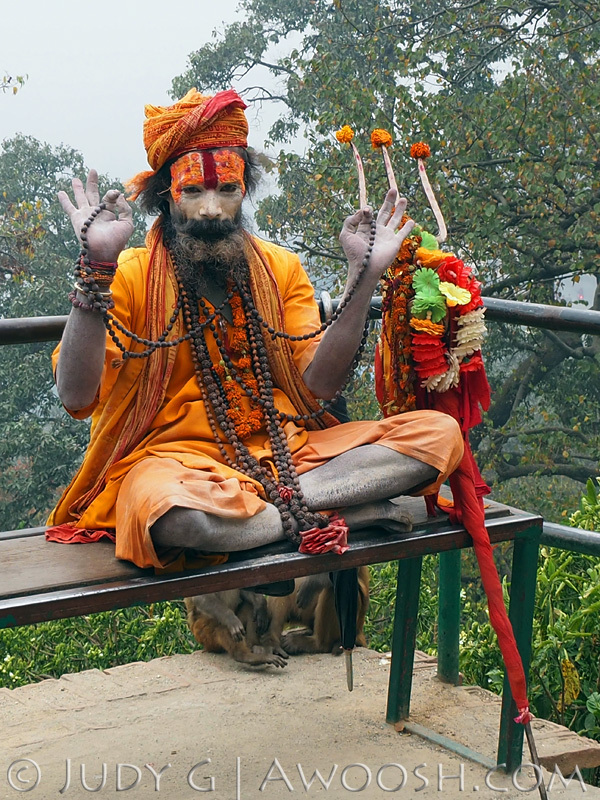 Like in northern India, there are often these costumed ‘holy men’ at the tourist sites. For a small fee, he let me take his picture. More monkey business at the Monkey Temple. There is lots of evident poverty, and no doubt many are still homeless after the earthquake. 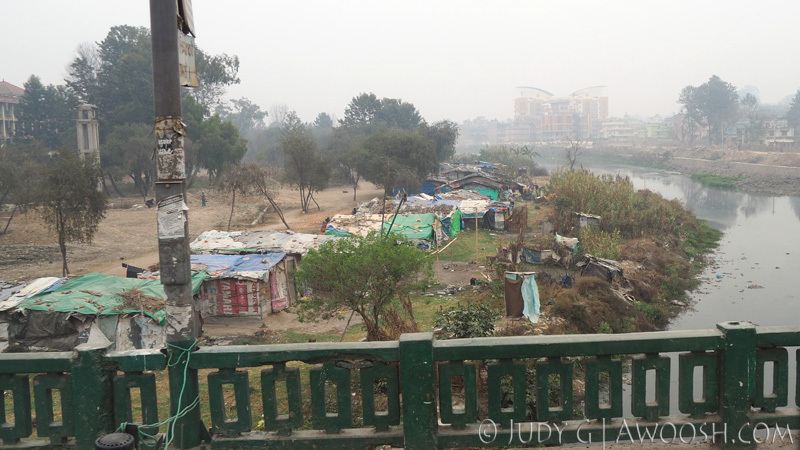 This is a tent town on the edge of a (very polluted) river. 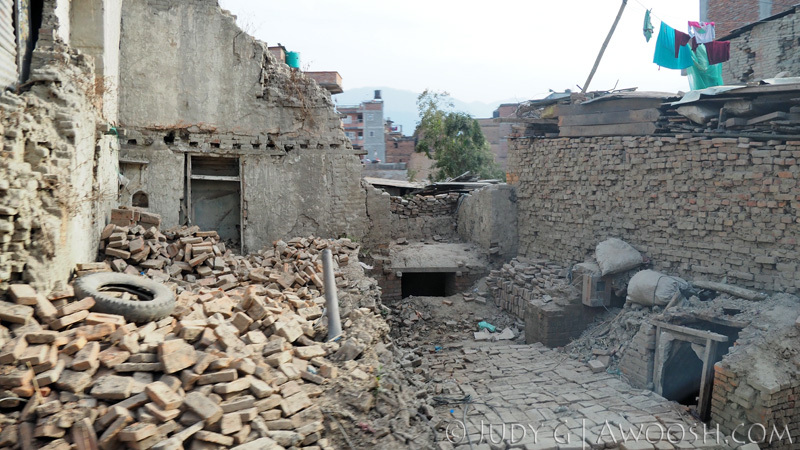 We saw a lot of places like this, where piled up bricks indicate where a building had fallen down. 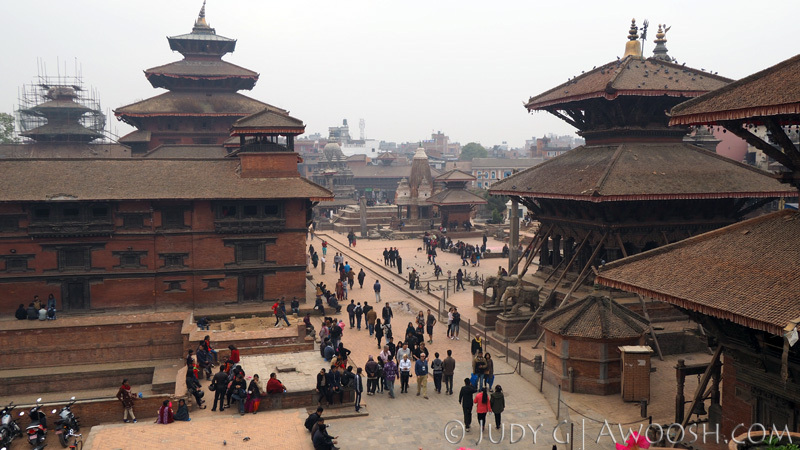 Our final stop of the tour was at the Patan Durbar Square. Here, the earthquake damage was fairly minimal. We were pretty whacked after a big day of touring, and after walking around the square on foot, we managed to find a cafe with a rooftop terrace where we had a coffee and peered out at the masses. A view of the square from above. More statuary, with a pagoda-style temple in the background. And so it ends. We had one more sleep in Khatmandu, and then a late morning flight to Delhi. Our flight from Delhi to JFK did not leave until quite late in the evening. See my hot tip above about the transit hotel in Delhi International. It saved the day. I haven’t shared many personal stories from this journey; I wanted this blog series to be more of a trip report/trip primer/photo essay kind of thing. But I have to say that traveling with two of my four lovely sisters, plus a close friend who I jokingly call ‘my sistah from another mistah’, made this an extraordinarily fun adventure. I am so grateful to them for all the planning that went into a huge trip like this, and for the many laughs we had along the way. It would not have been the same without them. And a special shout out to my little sis, who was quite sick for the last few days of the journey. She sucked it up, bigtime, and kept a smile on her cute face. I feel sure she was secretly wishing she was home, recuperating in her own bed, but she never complained. I am also super grateful to Bonnie Backer, who took the insanity of India and Nepal, and made some sense of it for us. Bonnie’s compassion, her enthusiasm, her positive energy, and her deep understanding of the Indian and Nepalese cultures (she has lived and worked in both places) was incredibly helpful in educating us about what we were seeing and experiencing. I can’t recommend her enough for those who think they might like to take a tour in India, and/or Nepal. You can contact her here —-> dreamingofindia@aol.com. It took me a while after returning home to be able to fully process my thoughts about this trip. So much of it was great – most epecially touring this part of the world with three incredibly positive and resilient ladies. 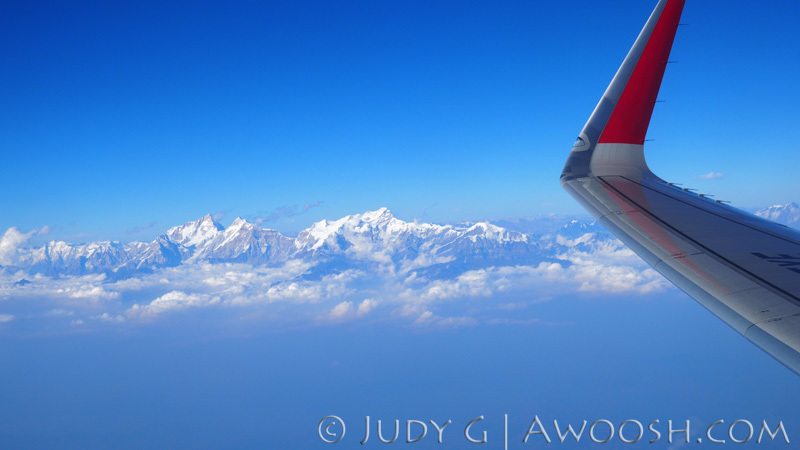 But truthfully, India and Nepal aren’t easy places to visit – there is so much poverty, noise, chaos, and stress. There is sensory overload at times – India is visually beautiful and ugly, often in the same eyeful. It is loud – leaning on one’s vehicle horn in the city is apparently totally acceptable, and makes for incessant, ear ringing cacophony. And Indians are not big on personal space – you can’t go to India and expect to not make literal contact with people. The feeling of how truly privileged I am to have been born in Canada – a beautiful, clean, spacious, progressive, and socially conscientious place, was overwhelming for me at times. Why some are born into hardship in places like India, while others are born into opportunity in places like Vancouver is a question I don’t have an answer for. I don’t know if it is karma (which is what the Hindus and Buddhists would believe), or just incredibly good, dumb luck. One of the things I have been thinking a lot about since returning home is how I can help. In the face of a billion plus people in that part of the world – with a large percentage of them living in truly challenging conditions, what can I do to make a difference? One of our daughters has been to India several times. On one of her early trips, she found herself at Amritapuri Ashram in Kerala, a southern province of India. She had heard about a woman there – Amma (aka ‘the hugging saint’) – who has become a bastion of compassion and selfless service. Born into very humble beginnings, Amma is now a force for good in India, and in the world. Her charitable organization (which is volunteer from the top down) funds schools and hospitals in India. She is also all about environmental awareness (clean water and sanitary toilet facilities being two current big projects), as well as providing learning opportunities for women. From what we witnessed, many women in India still appear to be very much second class citizens. Embracing The World is also very big on disaster relief, worldwide. Amma has a huge community of followers, in many many countries, and with their help, her organization is often a very early responder in disaster situations. So for those, like me, who want to help, here is a place to start: Embracing The World. 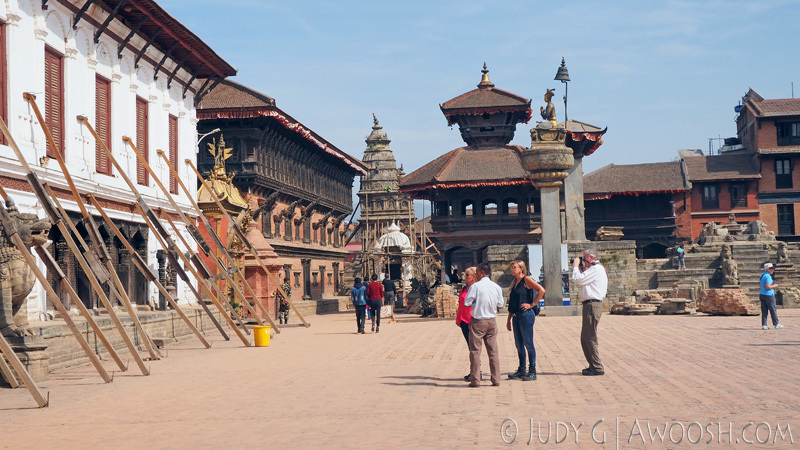 This entry was posted in Photography, Travel, Trip Reports, Writings and tagged Bhaktapur, Bonnie Backer, Bouddahanath, Budhanilkantha, Holiday Inn Express Delhi Aiport, Khatmandu, Patan Durbar Square, Swayambhunath. Bookmark the permalink.